AJB Hyakkendana Beer is a 4.5% blond ale from Anglo-Japanese Brewing Company, based in Nozawa Onsen, in Nagano, Japan. It’s part of their collaborative range, with this one being brewed with Mikkeller Beer and uses Mosaic hops. AJB Hyakkendana Beer was first released in August 2018 though it has seen a slow bottle release since then. AJB Hyakkendana Beer poured out a hazy golden straw colour with a mediocre amount of flat white head on top. The head faded fast to a few bubbles around the outside of the top of the beer, leaving a few sticky lines across the top. It had a potent soapy citrus nose to it, with some hints of sour biscuit cracker malts coming through too – which all proved to be bolder once AJB Hyakkendana Beer had warmed up to room temperature. The body to AJB Hyakkendana Beer was a little flat with some hints of sticky sour hoppy bitterness coming through as well. The citrus lemon hops brought something interesting to this blond ale though it did end up feeling a bit one-dimensional after a while. It would have been nice to have had some more malt flavour coming through the hops, as the faint wheat and biscuit notes just couldn’t move the hop flavour out. 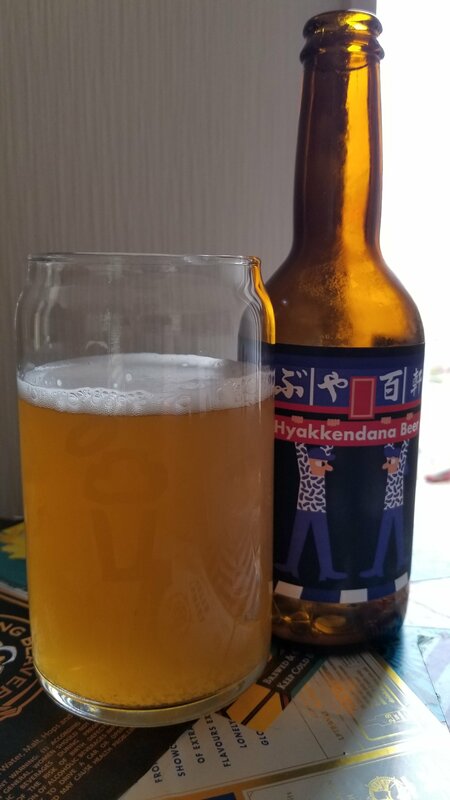 AJB Hyakkendana Beer is an interesting take on a blonde ale – perhaps some more malt flavour to contrast against the hoppiness would help it out.